Retired service dogs may have only a few years of life left. Puppies get props for their cuteness, but if you're looking for an older dog who needs a home, a service dog may be for you. Whether civilian or military service dogs, these canines are fully trained and ready to live out their retirement in a stable, loving environment. 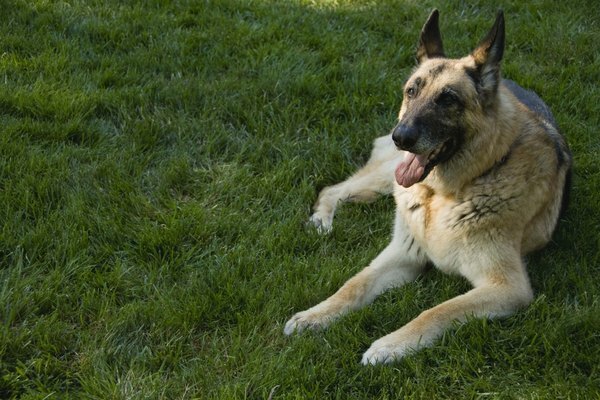 Contact a local military base that adopts out retired military working dogs (MWDs). Make sure that you call the base from which you would be adopting a dog—the Military Working Dogs website offers a directory of bases that shelter and adopt out dogs. When you call, ask if they have any dogs that have been declared "pending disposition" or "excess" and ready for civilian adoption. Ask for specifics about any dog who is recently retired and/or up for civilian adoption. For example, you may want to ask about size, breed, age and health, so know your own priorities before you get a handler on the phone. Start the adoption process as early as possible. If a dog is available for adoption and nobody else is in line to adopt, inquire about filing your paperwork immediately. Depending on your local base, MWDs may be difficult to come by—at some bases, the wait list for adopting a service dog may be months long. The base in charge of adoption will require you to fill out some paperwork about your household and your intended care of the dog. Contact an agency that trains service dogs to inquire about adopting other types of retired or displaced dogs. For example, while you would call an appropriate military base about retired MWDs, you may contact a training academy for guide, therapy and other service dogs. These dogs may include retirees and also younger dogs who are, because of age, health or temperament, ending their careers as service animals. Just as you would when adopting a military dog (or any other dog, for that matter), you will have to file an application with the agency or academy releasing the dog. Doberman Pinscher Rescue in the U.S.